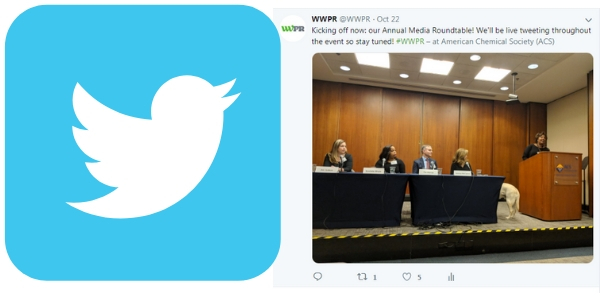 Skilled moderator Lisa Matthews (@LisaNMatthews), Assignment Manager for the Associated Press in DC, returned to guide an insightful panel discussion with four reporters at WWPR’s Annual Media Roundtable lunch on October 22. The American Chemical Society hosted this sellout event. Panelists Tim Homan (@timothyrhoman), News Editor for The Hill; Jen Judson (@JenJudson), Reporter for Defense News; Andrea McCarren (@andreamccarren), Reporter for WUSA9; and Scarlette Whyte, (@ScarletteWhyte), Senior Producer for The Lead with Jake Tapper on CNN provided feedback on how to contact them, how best to pitch them, how to cultivate productive media relationships, and much more. Starting with when to pitch and how much lead time to provide on a story, the panelists all had different answers. Some of these differences are due to their schedules and work style, while others are due to print vs television. 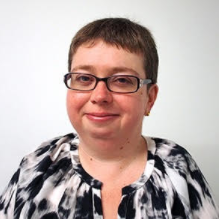 For example, Jen Judson frequently travels internationally to cover stories, so often is not available for pitches. For print, more lead time helps the reporters research a story. However, TV coverage is planned very quickly so short lead times are expected. They all agreed that they are overwhelmed by email so a pitch must be very alluring to make it through to even be read. “You have three or four words to hook me,” explained Andrea McCarren. A targeted subject line can help attract attention, according to Jen Judson. This means it speaks to issues she is covering or provides compelling news. Do you want to beat the odds? 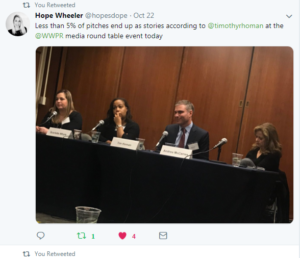 Tim Homan explained that “less than 5% of pitches actually end up as stories.” It helps to do your research on reporters and follow their social media accounts. This will give you more information on what they are reporting on and when they may be interested in information or experts for stories. Focus on a news hook when you pitch and why the story is relevant to the reporter you are contacting. When you’re pitching, have everything ready. Know your spokeperson’s availability for interviews. Provide materials (such as data or infographics) right up front. Consider it a package that needs to be ready the instant a reporter may respond. 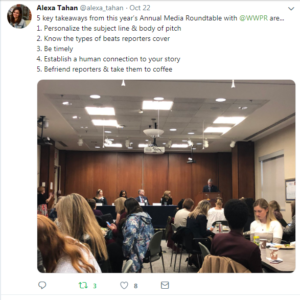 Many reporters also like a human connection to a story or a “real person” who can be interviewed about the issue or impact on their lives. One good tip is to consider pitching during down times, like August, weekends, or over the holidays. Outlets may be looking for content and providing a good story to them when they need it will be remembered. Scarlette Whyte also noted that her show likes anniversary stories for reflecting on milestone moments. Perhaps the best advice came from Nigel, the service dog Andrea McCarren is training for a military veteran, as he demonstrated quiet patience sitting beside her throughout the discussion. Looking dapper in a tuxedo tie, he showcased how PR pros need to patiently persist in their media outreach.